The latest TEDxUtrecht took place this week and it seems that one of the discussions was about ways to encourage Utrechters to turn to tap water instead of bottled water. Not only is tap water the cheaper option, but it’s also better for the environment, since you don’t end up with all those plastic bottles. Considering the fact that plastic recycling isn’t the easiest form of recycling here, it seems particularly relevant. 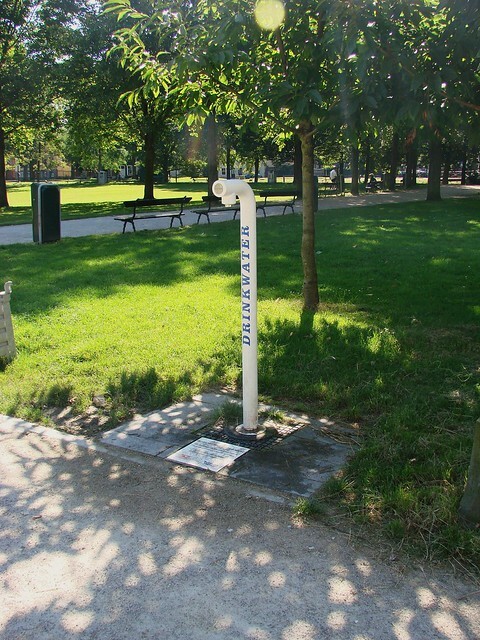 The Utrecht Tap Water Challenge, organized by TEDxUtrecht and supported by the Join the Pipe foundation, Vitens, and the city of Utrecht, wants locals to get involved and come up with ways to encourage others to choose tap water. The winning idea will win a prize and have the opportunity to see their idea implemented. The deadline is 30 November 2012. A number of free water points have been established in locations around the city and other locations are being considered. If you’re out and about and have a reusable water container or some other sort of cup, you can always fill up, rather than spend €1 for a plastic bottle of water. In a pinch, you can go really green and use your own hand, of course! There’s one at Janskerkhof, Park Lepelenburg, Neude, Griftpark, and Marco Poloplantsoen. Perhaps you’re like I used to be and have some unpleasant associations with tap water, whether it’s smelly, tastes bad, or comes with a warning as it did years ago when I lived in New Orleans. I used Britta filters and bottled water like many people and continued to do so when I first moved here, simply out of habit. Then I tasted the tap water here. It’s actually really nice! Utrecht has a reputation for the quality of its water. In fact, the water we get from our tap is the same spring water that gets bottled by brands like Sourcy. Not everyone has access to quality tap water, but it’s worth trying from time to time, rather than simply buying bottled or shelling out for all of those filters. The irony is that we do have such great water in Utrecht, but it’s very hard to actually get tap water in restaurants here. They’ll bring you a bottle of still water, instead, as there’s no profit to be made off tap water. Perhaps that should be my suggestion for the competition: encouraging restaurants to provide tap water on request. 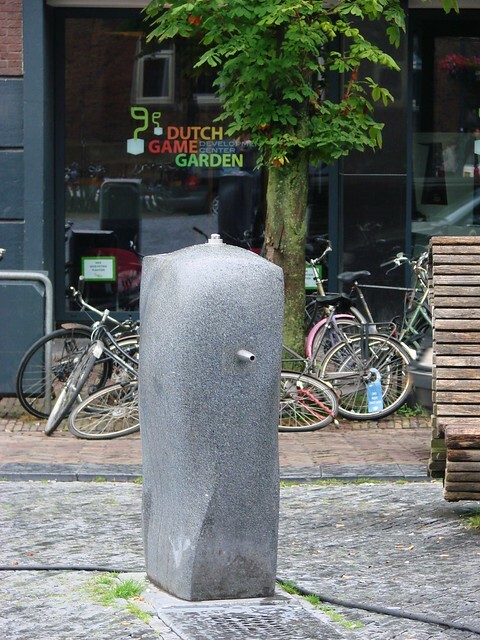 This entry was posted in food, news, photos, points of interest, resources and tagged clean water, drinkable water, drinking water, environment, Join the Pipe, photography, tap water challenge, TEDxUtrecht, Utrecht, water points by Alison. Bookmark the permalink. I don’t know whether this would work there, but the best way I can think of to promote drinking tap water would be an advertising campaign showing parents giving glasses of tap water to their children. Simply illustrates it’s safe & healthy. I’m sure that’s a valid point to raise. I’m not really sure how widespread the idea is that bottled is better here, but that’s because I heard early on from Dutch friends that the water here is good. I’m certainly curious to see what direction they do take. What a brilliant idea and I hope it meets with success! Waiters here in NY wouldn’t be the same without their large jugs of NY Tap! Ha! Maybe the possibility of having contests with waiters racing about with full jugs should be proposed! I can highly recommend the Dutch-designed Dopper bottle as a nice way to carry tap water: http://nl.dopper.com/en/ Good-looking, leak-proof, and you can sanitize it between uses! Those are nice! Thanks for the link! Join the Pipe has some funky bottle designs and carafes for sale, as well. Great post! And how about praising the restaurants that are happy to provide plain old Utregs kraanwater? I’ll start: Taj Mahal (Zadelstraat) and Het Gerecht (Catharijnesingel). I rarely eat out, so I have no idea who does serve it, so thanks for listing them! Getting the horeca on board should be a major objective. I guess I just don’t eat out often enough to have experienced the glass of water. 🙂 It’s funny that you didn’t think the water here tasted that good. Now I’m curious to try water from the southern regions! I’ll leave that up to the dog! I had no idea that the Dutch were now drinking so much bottled water. You’re right, Utrecht water is great. Have you had Den Haag or Rotterdam water? That they get bottled water I can understand. I can’t remember if I’ve ever drunk water in Den Haag. Come to think of it, probably not, just coffee and wine! Still, it can’t be as bad as the awful sulfur water in Jacksonville, Florida. I don’t know. I remember it being pretty darn bad in Den Haag. Here in Portland, Oregon we have wonderful tap water, but still need/have a campaign to get people to forgo bottled water. When we were in Germany my husband asked for “Leitungswasser” (tap water) in a restaurant and the woman wanted to know if we wanted it for our car! I drove our friends nuts when I filled my glass from the faucet. It’s strange/sad how good a job the bottled water marketing people have done to get people to buy only bottled water and not drink their own tap water when it’s perfectly fine. 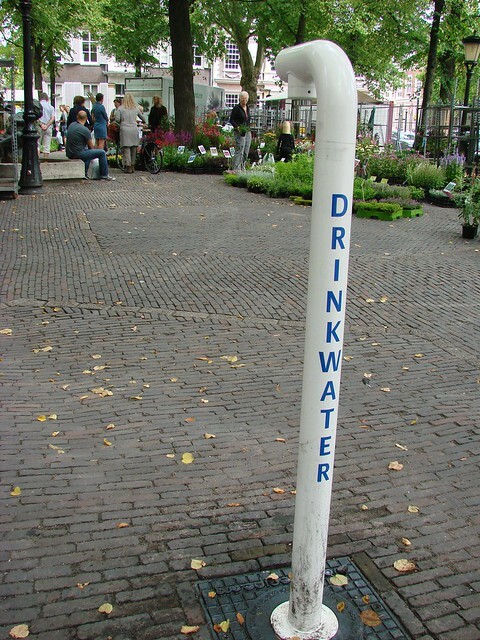 As a Dutch I must say I am rather surprised to see that people are using bottled water as an alternative to tap-water. I know that when I am abroad, I do the same, because tap water abroad often is of less quality. But I have never considdered using bottled water instead of tap water when I am in the Netherlands. I always got really annoyed by my ex BF and current BF (both from abroad) that they insisted on buying those expensive bottles. As I have worked for the water company Vitens, I know the quality of the tapwater. Vitens provides the best tapwater in Europe, and it’s of no less quality than bottled water of SPA and Sourcy indeed. What great ideas are posted here! Unfortunately, we can’t post them under your name in our Idea Challenge environment. Hence my question: could you please post your ideas on http://www.fullcreativepotential.com? That way we can keep ‘m together and start collaborating on them with you guys! Thanks so much in advance for your time & effort!